Within two weeks the unthinkable happened: a vast force of common people invaded London, led by a former soldier, Walter Tyler, and the radical preacher John Ball, demanding freedom, equality, and the complete uprooting of the Church and state. They believed they were rescuing the King from his corrupt ministers and that England had to be saved. And for three intense, violent days, it looked as if they would sweep all before them. 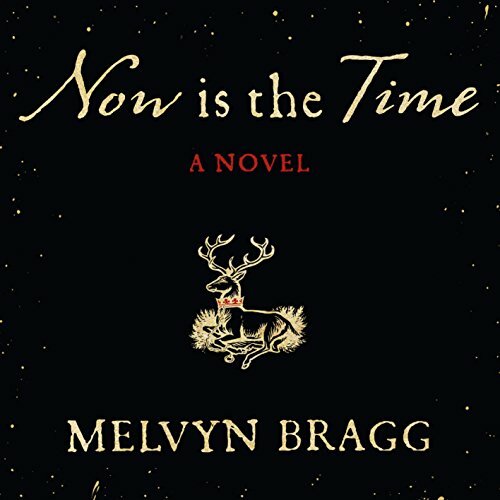 In this gripping novel, Melvyn Bragg brings an extraordinary episode in English history to fresh, urgent life on both a grand and intimate scale, vividly portraying its central figures. It is an archetypal tale of an epic struggle between the powerful and the apparently powerless. Would you consider the audio edition of Now Is the Time to be better than the print version? I had not read the print version. I love the entitled, influential Joan of Kent. What does David Timson bring to the story that you wouldn’t experience if you just read the book? The narrator is superb and a joy to listen to. I purchased this audio book after hearing the author interviewed on History Extra podcast. This tale brings to life a period of time I was not familar with in English history, and the extraordinary characters that populated it. I had only a hazy knowledge about the Peasants’ Revolt of 1381 led by Wat Tyler, but knew that it was triggered by a Poll Tax levied on all to pay for Richard II’s foray into European Wars. Melvyn Bragg has enlivened the historical record with his imaginative conjuring up of the day-to-day interactions of the main players in the dramatic events of the period. It is surprising how near the rebels were to over-throwing the government and it appears that only their supine devotion to Richard II reversed the tide of insurrection. Sadly, Richard II was not worthy of their respect. The story contains long passages of political and religious discourse that could be tedious but the author’s strong character development, lively style of writing, and the excellent narration make it a worthwhile listen. A historical novel on a part of history I knew nothing of. Pleased I read/listened. Narrator was appropriate and one of the best in the business. Read/listened before a talk by the author, who disappointed by largely recounting the novel without development. The novel was much better than the talk.